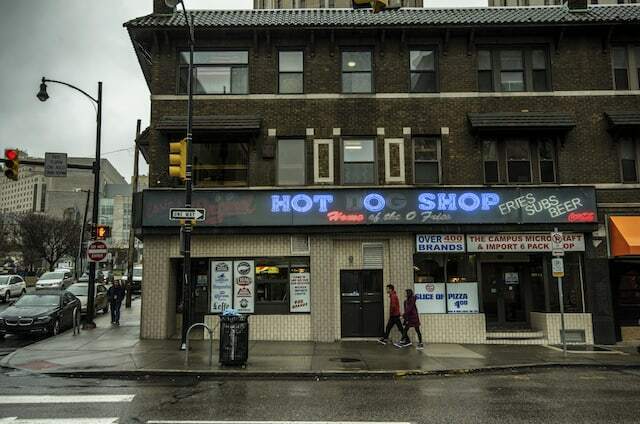 The Original Hot Dog Shop, Pittsburgh | Good. Food. Stories. A glowing marquee on Forbes Avenue in Pittsburgh boasts “Essie’s Original Hot Dog Shop.” It’s my official ‘Welcome Home’ sign. I take a deep breath of equal parts comfort and terror when I see it. I know what lies ahead. Part of the excitement of going out to dinner is choosing where to go. But for my family, this dank spot is our number one option for dining out. At the Original, a standard meal was always a hot dog and a heaping portion of “small” fries, fried three times by a lady with three teeth. A small fry can feed a family of four, and it did, easily and often. 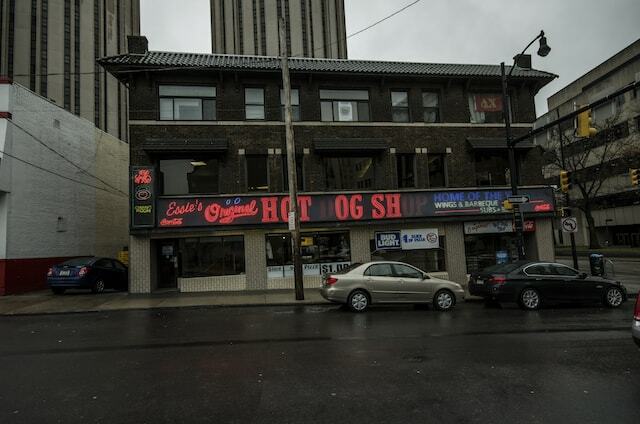 The Original Hot Dog Shop is located in the heart of the University of Pittsburgh’s bustling campus, right across from what used to be Forbes Field. The “Original,” the “O,” or the “Dirty O,” the most accurate of its affectionate nicknames, has been a staple in my family for years. My dad has eaten there since he was a kid. Arguing against a trip to the “O” is pointless and makes me feel like I’m offending my ancestors. It’s just something you don’t do. When my uncles visit from L.A., they head there immediately. An 11:00 a.m. visit is not unheard of. 10:00 a.m. visits have happened. They have brought the hot dogs back to California. It’s deemed the absolute best hot dog by every relative I’ve met, even if they haven’t been there in 30 years. The hot dogs are the reason you come here: thick-skinned all-beef treasures with an amazing snap! upon the first bite. My dad has always handled the hot dog counter, as he prefers scouring the griddle line-up for the crispiest wiener. The mustard is supreme—the perfect golden spicy brown. In my family we firmly agree that brown mustard can make or break a sandwich. They use a wooden cylinder to spread the mustard, which I’ve never seen anywhere else. 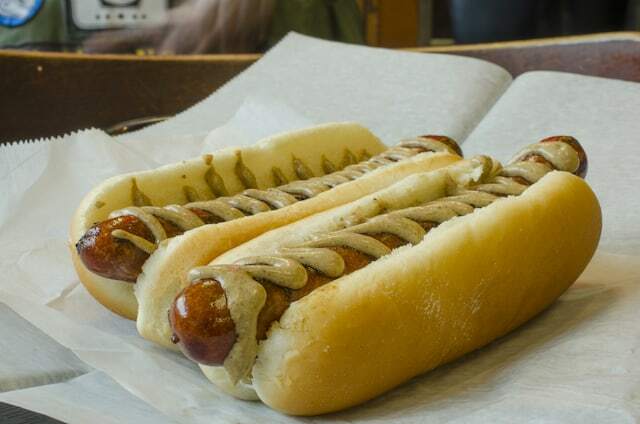 It allows a nice smear of mustard to slather the dog evenly. I think they now offer yellow mustard for the non-Kaisermans, or in our opinion, the people who have no handle on their lives. Nowadays, the hot dog counter also has chicken fingers and “hot dog parmesan,” a very ‘Burgh-esque tragedy of cheese and marinara sauce over a hot dog. My sister has ordered this because she likes to defy tradition. Since the “O” is in the middle of a busy campus, it’s hard to park. That’s step one. It really just builds up the dread and/or excitement. Once you walk past the token homeless person loitering by the door, your fate is sealed. The “O” is a playground of junk food, and it’s divided up like a cafeteria with separate counters for different items. The crispy skinned dogs. 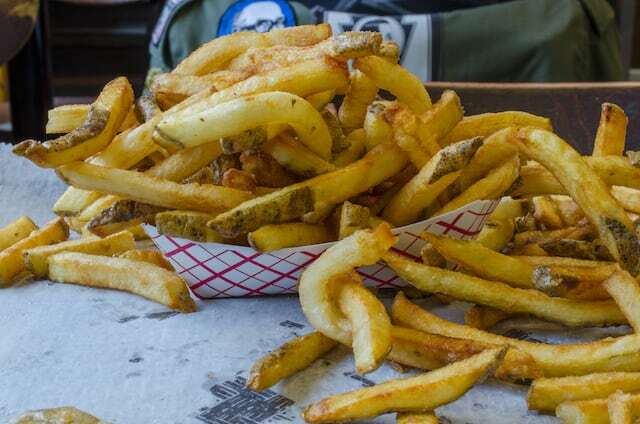 Heaping mountains of fries. Thin-crust pizza oozing with more grease than crust. It’s a popular late-night spot, but we’re usually there by 6 p.m.
Employees in grease and sweat-soaked T-shirts dish up messes of food without a smile. The brown tile floors slightly obscure the dirt and scuff marks from years of hungry hoards trekking in. I feel bad for the people who just stop in to use the bathroom after a Pitt game, and not just because they’re missing out on the best hot dog and top-tier customer service. The words “Pittsburgh basement” alone send a chill up the spine, and the bathroom at the “O” is on my list of top childhood terrors. I went down there once and threw up in the hallway, I think out of fear. As a kid, teen, and in diapers (I’m sure), I’ve been dragged to the “O.” These trips occur both on dark winter nights and light summer evenings, when as a teen all I could think about was meeting up with my friends. But there’s something about the place that sticks to you, the same way the smell of fry oil and cigarettes sticks to your clothes long after you leave. There’s a reason why I can’t say “no” to the “O.” It’s tradition. It’s where everything that matters comes together on a french fry crumb-laden table, still slicked with grease from the people before you. It’s where I learned not to talk to strangers because if I waited just a little longer, we would get our own french fries. It’s where my kids will learn what a great hot dog tastes like. Next door at Five Guys is where they’ll learn how to politely ask to use the bathroom. As an adult, there’s a certain pain I get in my chest when I leave the “O.” It’s a feeling unlike anything else, and it hits in the stomach too. Part of it is the feeling what I just ate may kill me before the night ends, and part is knowing it will be another year before I come back for more. The misery hurts so good.